Amir Khan has signed a deal to face Mexican boxer Canelo Alvarez for the WBC middleweight title in a fight which will take place on 7th May 2016 at MGM Grand, Las Vegas. In what is a very surprising move by Amir Khan to move to middleweight without having fought at this weight before has kind of left boxing fans in shock. Having said that he will be fighting for WBC Ring Magazine and lineal middleweight titles. 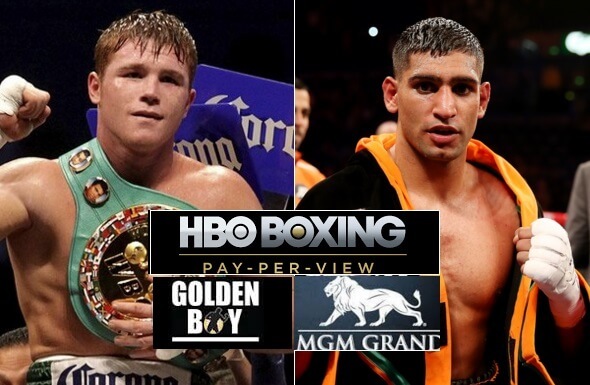 Golden Boy Promotions announced the fight today and it will be a 155lb catch-weight title fight in MGM Grand which will be broadcasted live in United States by HBO via Pay Per View. This was the third biggest fight Khan could get after missing out on Mayweather and Pacquiao but this fight will not only earn him big purse but also he has nothing to lose as he is fighting at middle-weight for the very first time. A fight with Kell Brook was suppose to take place this summer but that will be postponed for later 2016 or early 2017 depending on the result of Khan-Alvarez fight. UNDERCARDS Gold Boy Promotion and HBO are likely to add another big fight on the undercards which will be announced within next. Promotion Tours Number of promotional tours are announced starting in New York. London UK and atleast one more in USA closer to the fight. Canelo Alvarez vs Amir Khan Tickets: The ticket information will be announced in the first press conference which is set to take place in New York next week. Tickets are likely to be sold via ticketmaster.com but we will have more news and updates once the fight is officially announced. 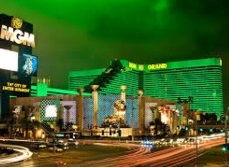 MGM Grand has capacity to hold around 16,600 people and we can safely assume the arena will be sold as the fight is taking place on “Cinco De Mayo” weekend. Which is a big day for Mexico and historically Canelo Alvarez and some great mexican boxers has fought on this weekend. So if you want to get hold of tickets you need to be updated and precise. We will be updating this page as soon as there any information about tickets is released. Tickets prices will start from $300, $500, $750, $1000 and $1500. What to expect In Khan vs Canelo Showdown ? Canelo Alvarez won the middleweight title from Miguel Cotto last year with an impressive win, his fourth consecutive win after he lost against Floyd Mayweather back in 2013. He will be odds on favourite to beat Amir Khan who has so many things going against him. Khan has not fought regularly enough in the last 3 years to suggest he can get a win over Canelo Alvarez. 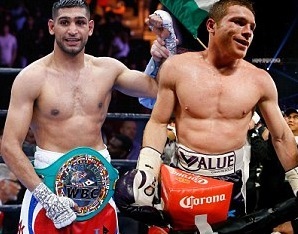 Amir Khan naturally much lighter compared to Canelo Alvarez who has been fighting at the middleweight for a long time. Khan has massive advantage of speed and he will be eager to follow Mayweather’s steps who defeated Canelo on pure boxing ability. But Khan is not Mayweather and Canelo has improved alot since his defeat. So its more of a mis-match and a casual fans dream fight.